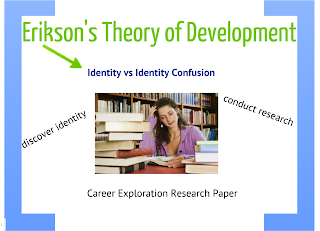 In a middle school language arts classroom most teachers will be dealing with students in Erikson’s fifth stage, identity versus identity confusion. 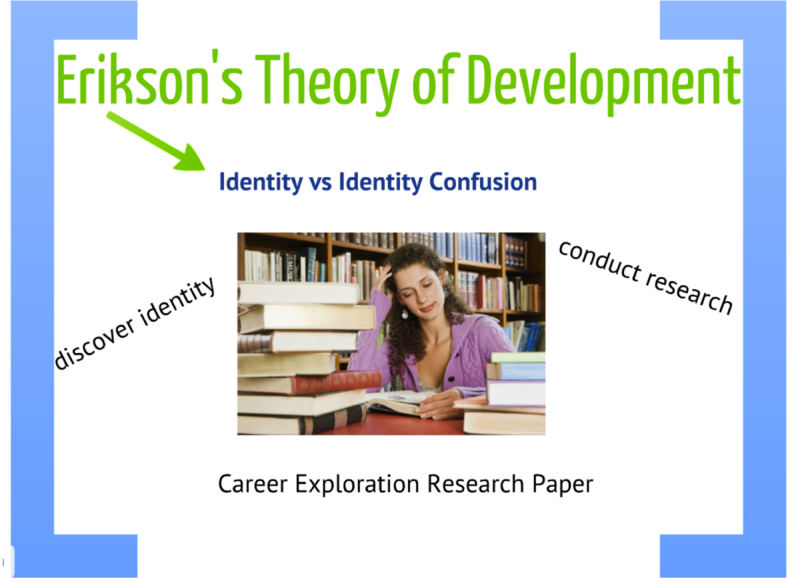 In order to help adolescents discover their own identity and purpose in life teachers may choose to assign a career exploration research paper. This paper will require students to research a career they are interested in. Students may be asked to job shadow or interview a person in the field they are interested in in order to gain a better understanding of that career. This would help adolescents gain a better understanding of their own identity and help them discover what they want to do in life. They will be required to conduct research, in which they reference their sources used in the paper. Students will also be required to write a reflection component, stating why they believe they would be suited for this type of career. This paper would allow students to conduct research and compile their findings as well as personal opinions into one document.